Here we are, Day 14 of AWESOME-tober-fest. It’s Hump Day everyone and we came here to talk about werewolves in TV shows. The previous two shows were live action, but our next three entries will be cartoons. Two of these cartoons were absolute favorites of mine growing up in the 80s. Today’s cartoon, however, I didn’t really get a chance to watch on TV as it was only on for one season. But it had a great premise that I love, even today, and I would have watched religiously. Today we will look at Gravedale High. 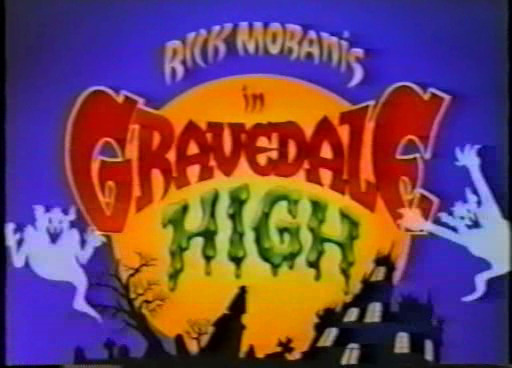 Gravedale High first aired in 1990. It was very similar to another of one of my favorite cartoons, Galaxy High. Just swap out aliens for monsters and change the perspective as the main character in Gravedale is a teacher, not a student. However, the “fish out of water in high school” theme is prevalent throughout both cartoons. Plus, it has Rick Moranis, who I love. The show was voiced by a lot of very famous voice actors.The first student on the left is Reggie Moonshroud, the nerdy werewolf. He was voiced by Barry Gordon, best known as Donatello from Teenage Mutant Ninja Turtles and the Nestle Quik rabbit. Rick Moranis’ Max is second from the left. Vinnie Stoker is the Fonzi-esque vampire and was voiced by Roger Rose whose been in Knight Rider and voiced characters on The Jetsons and Batman the Animated Series. To the right of Vinnie is Gill Waterman, the character based on Creature from the Black Lagoon. He’s voiced by none other than Jackie Earl Haley, he of the new Nightmare on Elm Street and Watchmen movies. Lastly on the right we have Frankentyke who is voiced by Frank Welker who famously voiced Fred from Scooby Doo as well as Megatron and Soundwave from Transformers. Other voices included Tim Curry as a mummy history teacher, Rikki Lake as a fat mummy named Cleofatra (subtle), Jonathan Winters as a zombie coach and Eileen Brennan (Mrs Peacock in Clue the Movie) as a teacher that looks like the Bride of Frankenstein. As you can see, it was a strong cast. Unfortunately, it only lasted 13 episodes, and it’s unclear whether all of those episodes even aired. I don’t believe this was ever released on DVD. I thought it had been released in the UK or Canada, similar to Drak Pack, but I can’t seem to find it on Amazon UK. You can see a few episodes on YouTube. So that was Gravedale High. The next two cartoon entries on Thursday and Friday are two cartoons I LOVED as a kid. While Gravedale High has a werewolf as part of the ensemble, the next two cartoons both star a werewolf. And one was based on a movie. Can you guess? Well, come back tomorrow and Friday to read about the final two werewolf TV shows for this week. Aso, check out the blog Countdown to Halloween for more Halloween-y, bloggy AWESOMEness. So, another day has dawned on this AWESOME-tober-fest 2010. This week, we are discussing werewolf TV shows. Yesterday I looked at Wolf Lake on Sci-Fi. Today, we look at one of the first shows ever on Fox Network, Werewolf. The story involves graduate student Eric Cord whose best friend reveals that he’s a werewolf and asks Eric to kill him with a silver bullet. Eric is forced to do so but not before his friend transforms and attacks him. Cord kills the werewolf but is now infected with the curse. In order to rid himself of his werewolf affliction, he either must kill himself or find the originator of the bloodline. A man Eric is told is the mysterious and crazy Capt Janos Skorzeny (played by Chuck Connors). So, essentially the episodes involved Eric dodging a bounty hunter while searching for Capt Skorzeny. Eric did manage to face and defeat the Capt, but in doing so found out that he wasn’t the originator of the bloodline. It was another, 500 year old werewolf named Nicholas Remy. So the searching and battling began anew. And the audience would not find out if Eric found him as the show was canceled before that could happen. While the show may have been average to good, the makeup effects were top notch. 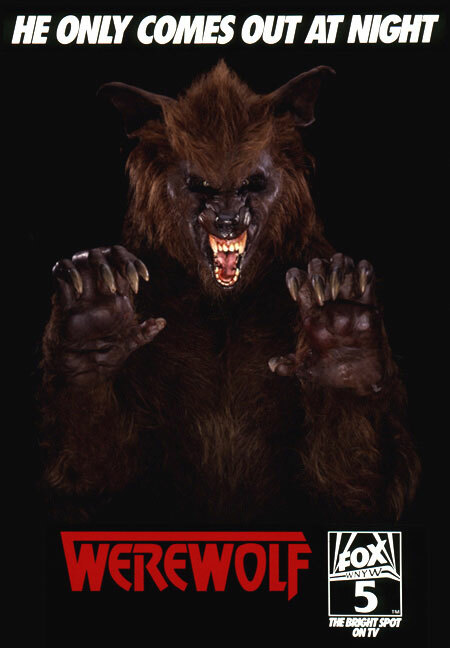 They were designed by none other than Rick Baker who famously designed the werewolf effects for An American Werewolf in London, The Wolfman (2010) and Wes Craven’s Cursed. The complete series had been announced to be released on DVD, however it was eventually canceled. Here we are, Day 12 of AWESOME-tober-fest 2010 and no signs of stopping. Two weeks ago I looked at werewolves in comic books. 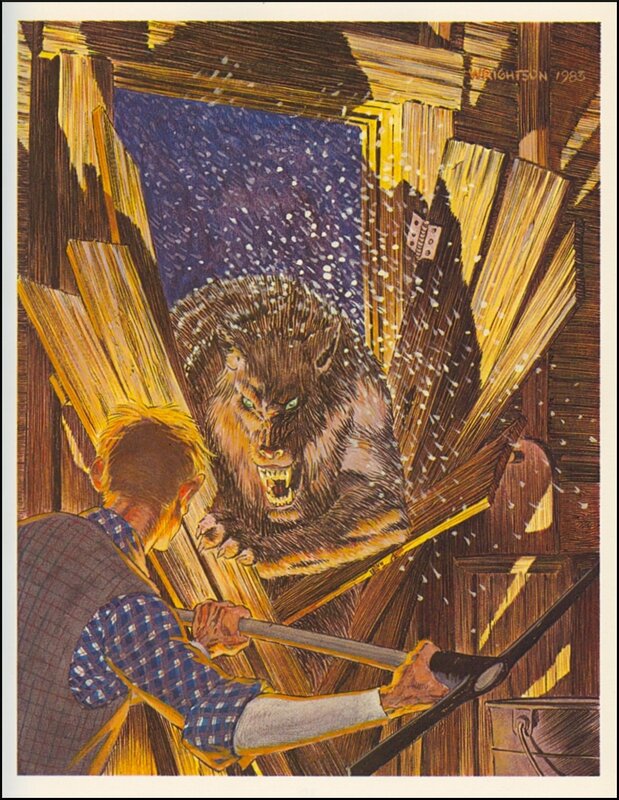 Last week I looked at werewolf novels. This week, we look at TV shows featuring werewolves. Our first entry? Sci-Fi Channel’s’ Wolf Lake. 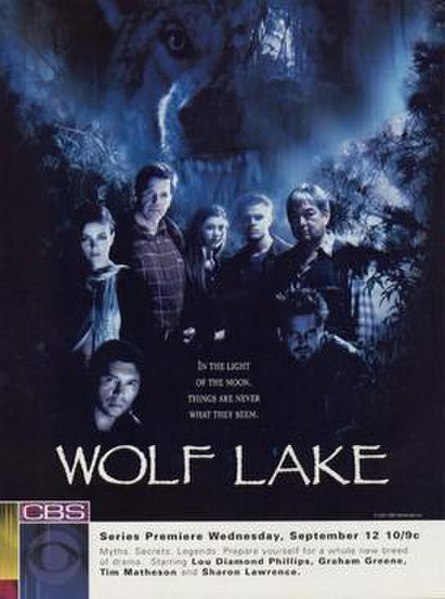 Wolf Lake was a TV show on CBS in 2007. It was canceled after nine episodes. The show had a pretty nice cast with Tim Matheson (Animal House), Lou Diamond Phillips (Young Guns, La Bamba) and Mary Elizabeth Winstead (Live Free or Die Hard, Scott Pilgrim vs The World). However, the show was a little melodramatic. Seattle police detective John Kanin (Lou Diamond Phillips as Kanin. Oh, get it? Kanin/Canine? Haha, so clever) proposes to his girlfriend but she suddenly disappears. Kanin’s search for her leads him back to her home town, Wolf Lake, WA. When he starts asking questions from the townspeople, it becomes clear that they are hiding information from him. And that information is that everyone is a werewolf…including his fiance. I’ve watched bits and pieces of this show. It felt like a cheesy Twin Peaks rip-off. I mean, the first episode is titled Meat the Parents. So, that’s the level of cleverness we are dealing with (that and Kanin/Canine). The reviews online aren’t that bad, considering, but again, it was canceled with only 9 episodes in the can. Unfortunately, Netflix doesn’t have the DVDs in stock so I’m forced to watched pieces of episodes off YouTube which is really not helpful because the series was filmed so dark that you can’t see a damn thing. 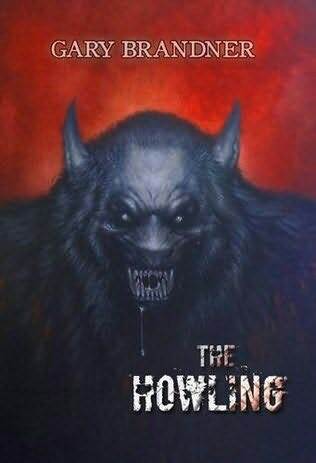 Alright, continuing on with werewolf novel week, this is a book you may actually have heard about (unlike the previous three days); Stephen King’s Cycle of the Werewolf. Stephen King’s famous werewolf novella (with illustrations by comics legend Bernie Wrightson) was published originally in hardback in 1983 (cover on right). The trade paperback would be released two years later in 1985 (cover on left). The story began as an idea for a werewolf calendar. 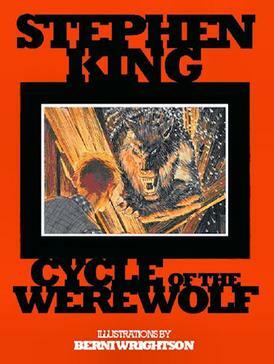 King was asked to write twelve chapters of a werewolf story to coincide with the months of the calendar. However, when the story became much longer than the calendar could accommodate, the project was dropped and the story was released on it’s own. While somewhere between a short story and a novella (with a little graphic novel mixed in there), this is one of King’s most well-known but frequently forgotten works. It is centered on the fictional town of Tarker’s Mills, Maine. Strange events and killings begin happening on each full moon. Townspeople say the killings are caused by a giant wolf or bear. Other people say they have a serial killer and they start to call him The Full Moon Killer. These killings go on for months. Marty Coslaw, a boy in a wheelchair, encounters the creature in his backyard during the 4th of July. He barely escapes, shooting a bottle rocket into it’s eye and injuring it. When Halloween comes around, Marty goes trick-or-treating and is constantly on the lookout for someone with an injured left eye as he now believes it was a werewolf that he encountered. Marty encounters a person with an injured left eye and begins writing anonymous letters telling the person that his secret has been discovered. Marty continues the letters until December when he finally signs one of the letters with his own name. On the next full moon the werewolf shows up to kill Marty and Marty uses two silver bullets he had his uncle make for him to kill the creature. The cycle of the werewolf stops almost exactly 1 year from when it began. This is a really good werewolf story. What I like about it is the fact that it feels like the middle of a larger story. We don’t know how the individual became a werewolf, nor do we know if all the normal “rules” apply to this werewolf. We find out in the end that silver does kill it, but Marty took a big chance luring the werewolf to him because he was not 100% clear that silver would, in fact, kill it. Then, everything seemingly returns to normal after the werewolf is killed, nothing is really left open for a sequel. It’s a straightforward story that feels like the final 1/3 of a movie. But, surprisingly, it didn’t bother me that I was missing 2/3 of the movie. Definitely recommend this, especially to King fans that have never “got around” to reading it (like me). Also, Bernie Wrightson’s artwork is extraordinary. It really brings the story to life. I bet the reason I didn’t mind the “missing” 2/3 of the story was because Wrightson did such a great job illustrating the scenes in this story. Really, really great artwork. As most everyone knows, this story was expanded and turned into the movie, Silver Bullet, starring Corey Haim and Gary Busey. I’ll review that movie in a few weeks. Welcome to Day 10 of AWESOME-tober-fest. We are in the middle of werewolf book week. Yesterday I looked at Howling Mad by Peter David. 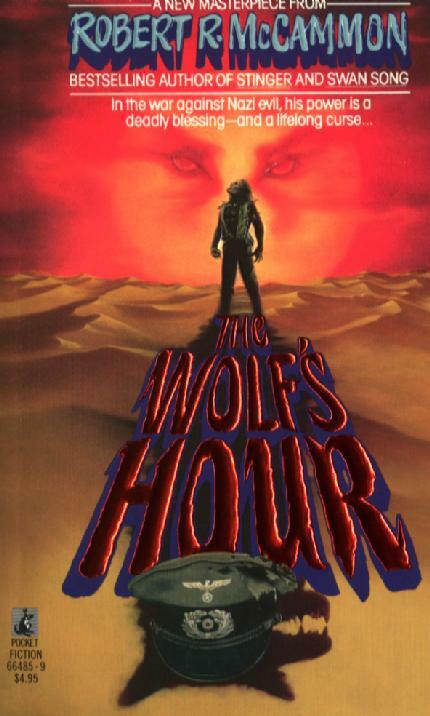 Today, I will review The Wolf’s Hour by Robert McCammon. This is an interesting novel. I originally read it back in high school. My dad used to take my brother and I to the “big” library in downtown Birmingham at least once a month for a special treat. It offered a wider choice of books than our local library. I’d pick out a bunch of books about comic books or werewolves or gunfighters and we could return them at any of our local libraries (or back to the original downtown location if we went back in time). It was pretty awesome. During one of my trips I was looking for werewolf fiction and stumbled across this book. It seemed a little long for me at the time at nearly 500 pages, plus it took place during World War II, which doesn’t interest me very much, but the lure of a new werewolf novel was too much to resist. So I checked it out. The story is definitely interesting. 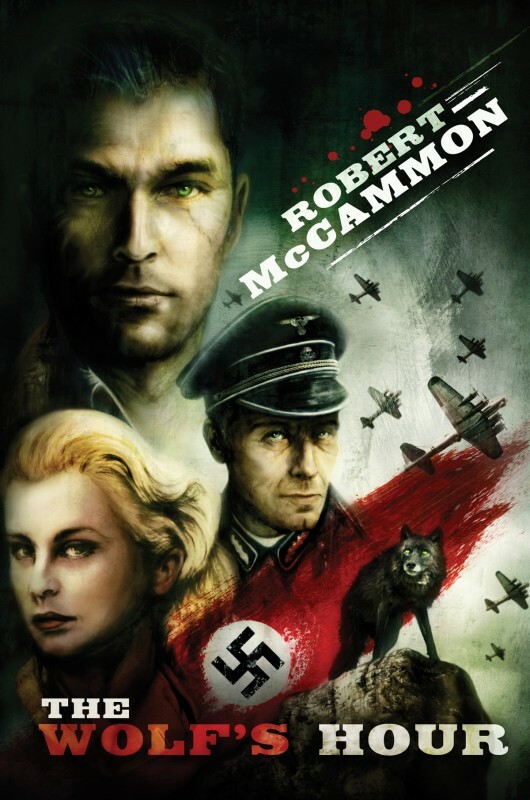 It combines two very different genres; the World War II spy adventure and the werewolf adventure. The main character, Michael Gallatin, was born into a wealthy Russian family. At an early age Michael was changed and then taken in by a pack of werewolves. He was taught by the pack how to live as a man and a wolf and properly use his newly discovered supernatural abilities. After years of learning and maturing with the pack of werewolves, Michael leaves them to see the world and create a life of his own. He offers his “skills” to the Allies during World War II and becomes a secret weapon in the fight against Hitler and his Third Reich. Michael goes on several missions and uncovers a secret conspiracy called Iron Fist that threatens to derail the Allies’ invasion of Europe and turn the tides of the war in favor of the Axis powers.